Bubba was abandoned in the Mission Viejo area, rescued by a woman with a huge heart who’s unable to take him in herself, but is knocking herself out to help him, even offering to pay for his shots. A few of us are trying to help her and Bubba get him into a loving home. He’s smart, funny and mischievous and the perfect age for a family with active children. What a perk! They can wear one another out! With his satellite-dish ears and striking red merle and white coat, Bubba has a unique appearance. What’s more, he is very sweet and gets along with other animals. What’s not to love? I would take him in a New York minute but my HOA prohibits more than two pets, probably a good thing since I would be overrun with cats and dogs by now. 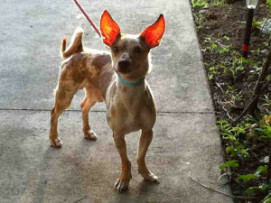 Bubba is at Orange County Animal Care at 561 The City Drive South, in Orange. His I.D. number is A1085397. Though this shelter strives with everything they’ve got to reduce euthanizing animals, overcrowding can cause it at this shelter. Let’s save Bubba. He has so much love to bring to you and a long life ahead of him.